Life may be a puzzle, but death is truly unknown. People tend to fear the unknown, so it’s no wonder that most of us are anxious about this final moment and whatever may come after it. Two friends of mine have had to face mortality this month due to cancer. I am incredibly amazed at how well they are facing it. They are with the experience and moving through it as gracefully as they can. It is heartbreaking to hear this kind of news and be unable to change the facts, but they are facts. If we avoid the biological truth that our physical bodies can get sick and will eventually stop functioning, we create an enormous amount of inner conflict and stress until that day comes. Life is no longer living if we let fear take over. Still, I have seen this fear in many places. In advertisements we are sold the idea that we must fight our biology on every front. Prevent and remove wrinkles, lose weight so that you look young again, take these pills to treat every symptom you can imagine, and don’t forget plastic surgery if you happen to age like every other human being on the planet. There is nothing wrong with taking care of yourself and being healthy, but we tend to sweep reality under the rug. Commercials for hospitals, drug companies, and lawyers will gladly remind you of death, but only in a fearful or dramatic way. There is no acceptance of death. We fight against it as though it were an enemy to be defeated. It is no wonder that we hold so much fear. As a life coach, you may encounter this issue yourself. In fact, spiritual coaches may be called on for “death coaching” frequently. If you wish to make death and dying a focal point for your life coach business, I strongly suggest looking into training as a grief counselor in order to become more knowledgeable about this subject. You may also utilize your spiritual practice and related teachings, as long as your clients are aware of them. You don’t want to be preaching to those who don’t want to hear it! Accept reality. In this case, accepting that physical death is inevitable is a huge first step towards freedom. This is kind of a balancing act: One should not be obsessed with the idea of death, but one should also not be afraid of the mere thought of death. By accepting mortality, we can overcome deep denial and anxiety, and get back to living our lives. Of course, this is not something you do overnight. It may even require the aid of a therapist or spiritual advisor, but it is well worth the effort. Accept the present moment. By being here now, embracing every moment, you are truly living. Life and death are intertwined, and understanding one helps you to understand the other. I have written about mindfulness before so I will keep it brief: By not clinging to the past or obsessing about a future that has yet to come, you can keep grounded and let go of fearful perceptions and illusions. When you look at the surface of the ocean, you can see waves coming up and going down. You can describe these waves in terms of high or low, big or small, more vigorous or less vigorous, more beautiful or less beautiful. 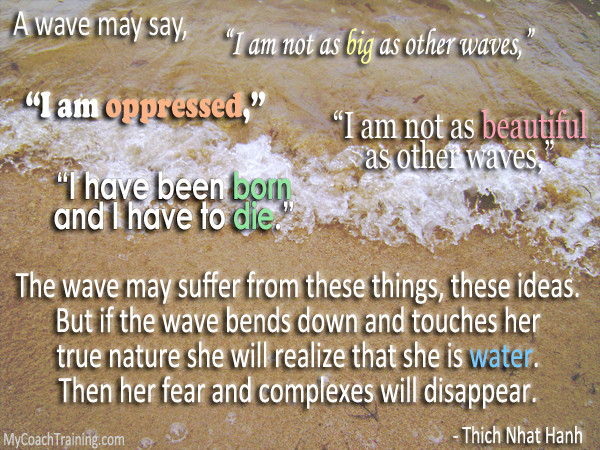 You can describe a wave in terms of beginning and end, birth and death. 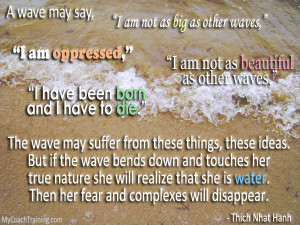 . .
Water is free from the birth and death of a wave. By taking this “ultimate” or broader view of life and death it can be easier to let go of what we have been taught about death and instead grasp the simple reality that lies beneath. Though an individual wave may “die”, it always returns to the ocean. Humans, animals, and plants follow the same natural cycle. In physics, the first law of thermodynamics states that energy cannot be created or destroyed; it can only be changed from one form to another. In this way, we are never truly gone nor can we be annihilated. On a spiritual level, we live on in our families and the people we have touched. How we have lived our lives and affected other people is a part of our continuation in this world. No matter what you believe about death, I think the best thing we can do is to live well in every moment, regardless of how many moments we may have left. I sincerely hope these words inspire you to do just that. Have you checked out Dr. Craig’s free report for coaches? It can save you a lot of time and get you back to doing what you love! I have a friend dying from cancer. this is my second time being real with the person with cancer and I realize that I have the gift to help.. how do I move forward with this? First of all, condolences for you and your friend. Have spoken to him or her about your desire to help? If so, and if the answer is an unqualified “yes,” then you know what to do. If, however, you attempt to help without this unqualified permission, you will run into resistance. “Qualified” help, on the other hand, means helping only in ways requested by the patient. In this case you are NOT trying to instruct or override your friend’s plan for recovery and/or death. You are simply holding his or her hand. This is hard to do, by the way, since most of us want to “fix” people. If you can resist the urge to fix your friend, you may see miracles unfold. Hold his or her hand and simply listen. This is what he/she needs right now more than anything.